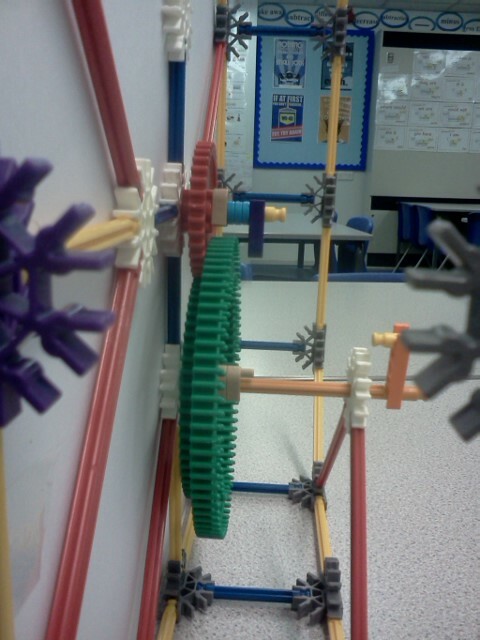 Today, with a group of kids, I made a K'nex clock. I had no idea if we could make it work when I set the task, but we were determined and worked through the problems we encountered. 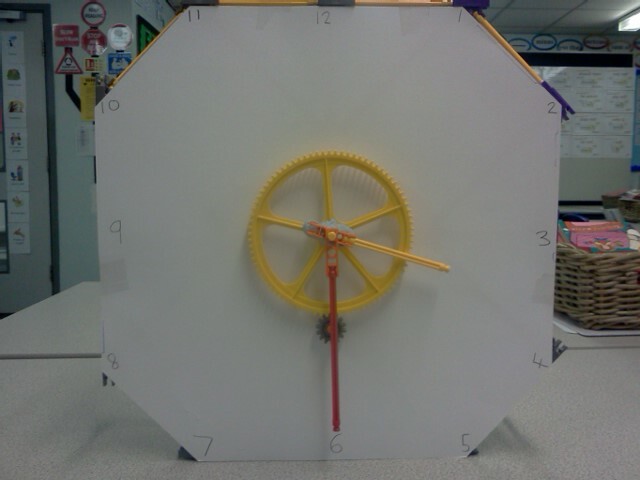 What we ended up with is a clock that, with the turn of one handle, sets the hour and minute hand in motion simultaneously. The only problem is that a 12 hour cycle only takes 11 rotations of the minute hand! Obviously, the main problem here is the size of the gears available, although I dare say with many more standard K'nex gears linking in various ways the mechanism could be made to work correctly. When the orange handle on the back is turned, the green gear turns which meshes with the red gear which directly drives the red minute hand. As the orange handle is turned the grey gear on the front of the clock turns the yellow gear which has the hour hand attached to it (with the aid of blu-tac to allow the minute hand to turn freely within the hour hand's gear!). The combination of a very small and a very large gear makes the hour hand turn slowly, whereas the two different but medium-sized gears produce a much faster turn for the minute hand. Next step: to connect a motor to it!